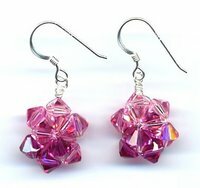 I have had these square Swarovski components hanging around for a while. Actually, I cleaned up my studio in a spring cleaning phase and put them away, then forgot I had them (which is why I generally don’t clean up). 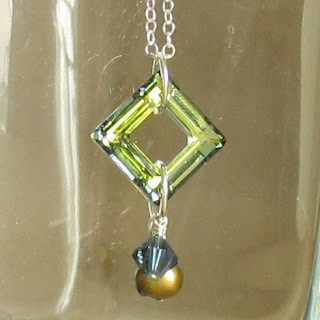 Anyway, I got them with the intention of making them into toggles, but I wasn’t sure how the crystal would hold up to wear & tear so I did a series of pendants with them (Click here and here to see). I have a few Halloween bracelets up for auction on eBay starting at $4.99. 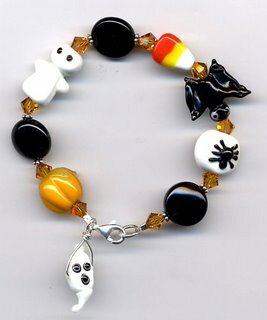 The beads are Swarovski crystal and handmade glass (lampwork) bats, spiders, candy corn, pumpkins, and ghosts. Get in the spirit! Heh heh. I’ve had the pattern for this puffy heart for a while, but didn’t try it until today. It is woven with no less than 73 Swarovski crystals (light rose satin) and took me about half a football game (my new time unit) to finish. It was easier than I expected and looks even prettier in person. Now I want one in every color! It’s the class sample for a new offering in October, but I had to share it now because it’s so sparkly and new. I looked at some patterns for weaving crystals and seed beads and, not having the patience of a real seed beader, decided to make up something simpler, quicker, and easier. 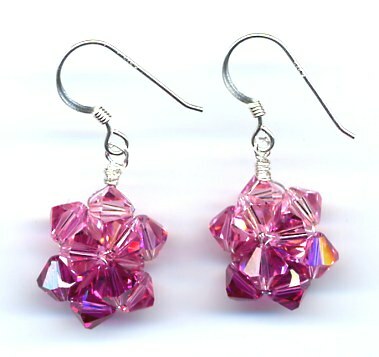 I may move on to more challenging patterns, but for now the focus is still on the ingredients: Czech rounds, Swarovski bicones (that color is Smoky Topaz 2AB), and seed beads. The Springy Links class is new this month and has been going well. July is kind of a short month since I’ll only be teaching 3 weeks, so I’m rolling out some new classes in August. 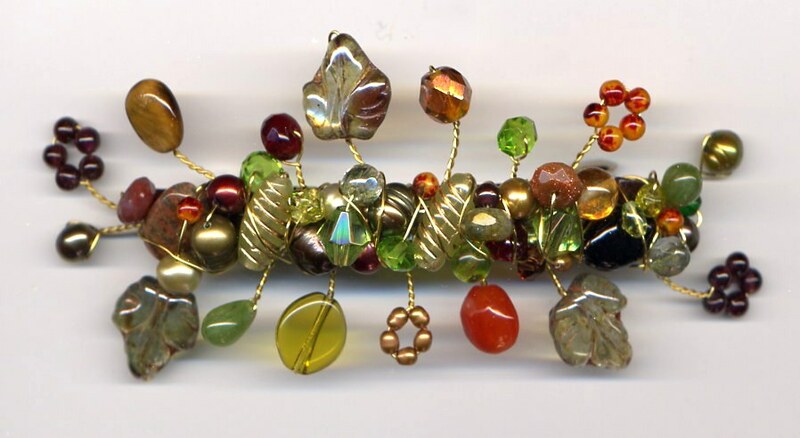 The Beaded Branches technique is a neat way to make bead-wrapped pins, pendants, and barrettes look more full. 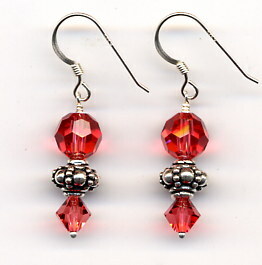 Crystal Ball Earrings are fun to make. 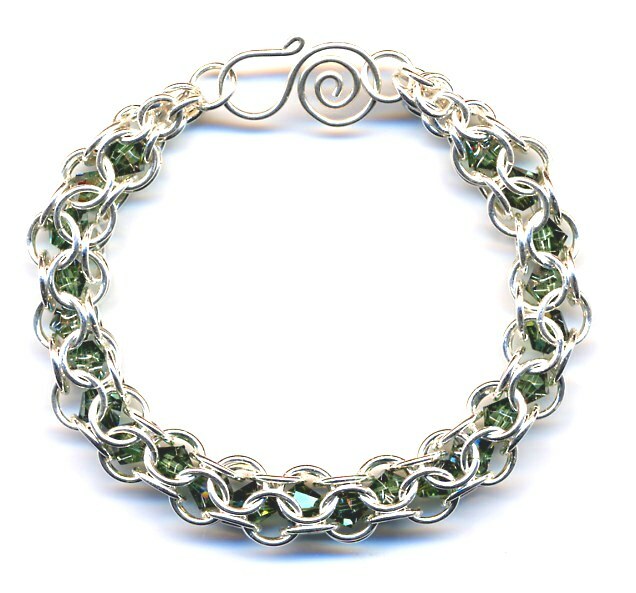 You can make a loop at the top, or just string or link the ball in a design as a bead. 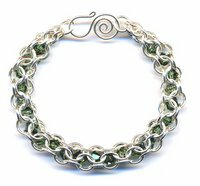 A new chainmaille class is the Caged Crystal Chain Weave, which is made of rings interlocking around a strand of Swarovski crystals. I think I’m as excited for new class challenges as my students are! One of my new favorite colors is that of a padparadscha sapphire, a bright pinky orange. The ideal color of a padparadscha has been described by some as the marriage between a Sri Lankan lotus flower and a sunset. This photo above is of my Tropicana rose this morning with one of its first flowers of the season. 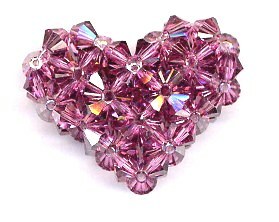 Swarovski makes a wonderful padparadscha color in their crystal beads, too. 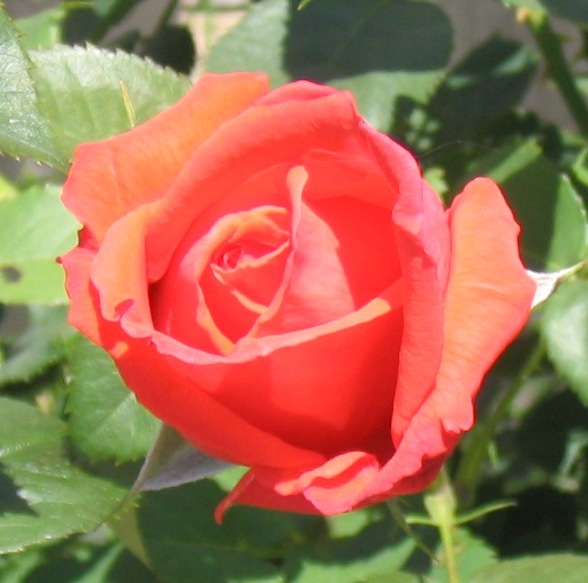 I am seeing this color a lot this spring, from geraniums to polo shirts. I especially like it with apple green.